Top Four Mid-Range 5-10 Cup Rice Cookers (3-5 cups) you can check out. In the medium size range (5-10 cups) you can check out our budget rice cooker reviews and high end cooker reviews. 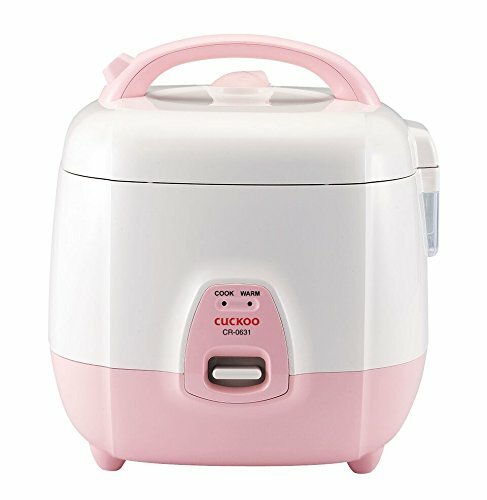 At 6.6 cups of cooked rice (3.3 uncooked cups), this rice cooker is a little bit unusual in terms of size but that doesn’t have any effect on its function. The general approach here is one that you will see in many different rice cookers, where you have a single button to start cooking. Unusually, the rice cooker doesn’t have a keep warm mode. Instead, it will simply switch off when done. With that in mind, this rice cooker is best suited for people who plan to cook the rice that they need and use it fairly soon afterwards. Likewise, it is mostly designed for cooking white rice and you need to wash brown rice before using it. Despite the limited functionality, this rice cooker does still have appeal. One advantage is simply that the price is pretty low. That makes it a good investment if you have never had a rice cooker in the past. 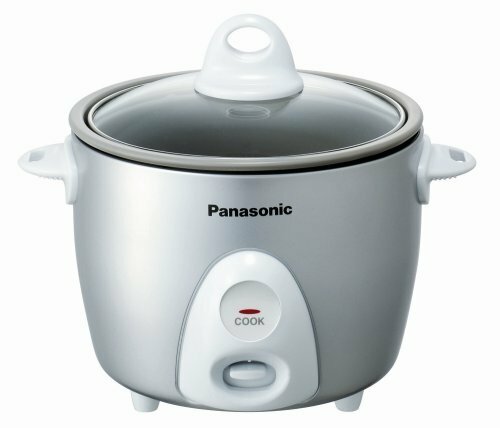 In terms of style, this rice cooker is pretty similar to the one that Panasonic offered. Likewise, this model also doesn’t have a keep warm function, although the larger versions that Zojirushi produces do. Nevertheless, the rice cooker is a pretty popular one, with an average of 4.3 stars from Amazon reviewers. 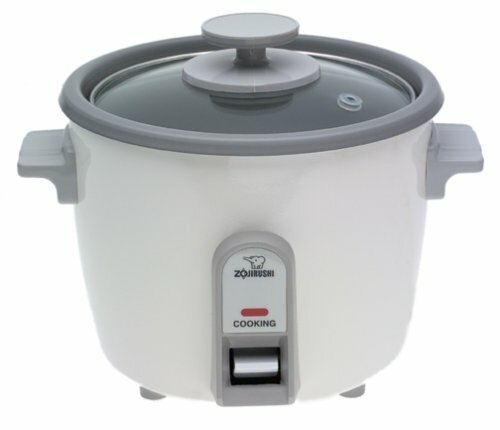 At the same time Zojirushi is a well-known brand for producing rice cookers and the company tends to have reliable products. Visually, this rice cooker is a little bit unusual, which may or may not be a good thing. This model is also more expensive than the other picks on this list but it has the distinct advantage of having a keep warm function. With that in mind, this is a good choice if you want to prepare rice and eat it later or if you simply aren’t sure precisely when you are going to need your cooked rice for. Reviews also suggest that the rice cooker is good at producing quality rice every time, without you needing to worry. The product might be simple in many ways but it manages to do everything that you really need in a rice cooker without being exceptionally expensive. This rice cooker is another option that comes from a well-recognized brand. This one also has the advantage of a keep warm function but one key difference is the use of a stainless steel cooking pot. When it comes to kitchen tools, I’ve noticed that there is a lot of debate about which metal is best in relation to food quality and the potential of chemicals leaching into your food. Because of this debate, stainless steel is often a desirable choice but most brands rely on Teflon-coated pots instead. As such, the fact that this product uses stainless steel may make it appealing for some people. That inner pot is also removable, which makes the process of cleaning fairly easy. Reviewers do note that it is a little harder to clean than a nonstick pot but that is the tradeoff you need to make if you want to avoid Teflon. One other advantage is the glass lid, which makes it easy to see how your rice is progressing. 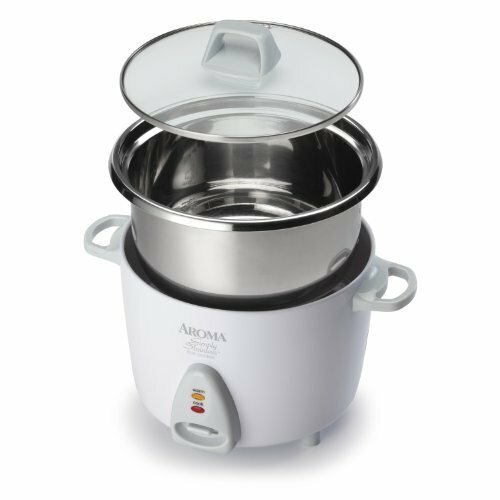 Out of the options on this list, the one we recommend most strongly is the Aroma Simply Stainless Rice Cooker. Although this is on the expensive end of the range both of the cheaper options did not offer a keep warm function. Realistically, the ability to do this is one of the key reasons for having a rice cooker in the first place, so buying one without that function is mostly a waste of time and effort. Even if you don’t think you’ll need the ability to keep rice warm, it’s still worth investing in a rice cooker with this function as you might find that you come to rely on it. In this list, we did highlight two models that have the ability to keep rice warm. However, the Aroma model is the more popular one of the two. It is also the least expensive of the two options, which is another reason for choosing it.